Plane Stupid, a network of grassroots groups that take non violent direct action against aviation expansion, has attracted worldwide attention for their campaign with “Polar Bears”, a disturbing online and cinema commercial. The UK group is campaigning to end short haul flights, airport expansion, aviation advertising, and is prepared to use the environmental movement’s favourite animal to do it. The Plane Stupid Polar Bears ad begins with strange objects can be seen falling from the sky. Gradually the viewer is able to see that the objects are, in fact, polar bears. 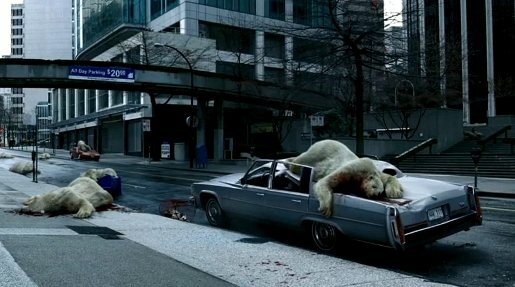 As the ad continues, the bears meet their brutal deaths, crashing against buildings, leaving a trail of blood, and landing on cars. An average European flight produces over 400 kg of greenhouse gases for every passenger, the weight of an adult polar bear. Filming was shot by director Daniel Kleinman via Rattling Stick with producer Johnnie Frankel. Editor was Adam Spivey at The Quarry. Post production was done at The Moving Picture Company by producer Scott Griffin, VFX supervisors Jake Mengers, 3D VFX Team: Vicky Osborn, Ahmed Gharraph, James Bailey, Kieran Belshaw, Georgios Chevourim, Richard Clegg, Andreas Graichen, Mark Harrison, Alex Kim, Adam Leary, Jorge Montiel, Tom O’Flaherty, Wayne Simmons, Stephen Murphy, Christoph Schinko, 2D VFX Team: Suzanne Jandu, Kelly Bruce, Steve Davis, Greg Howe-Davies, Alasdair McNeill, Stephen Newbold. Sound was produced by Anthony Moore at Factory and Andy Humphreys at 750 MPH.